This guest post has some great ideas, advice and inspiration on how to inject a flash of colour into your living room. Enjoy! If you feel your living room could really benefit from a new lease of life in terms of becoming more colourful and bright, we’re here to help. We’ve come up with five ways in which even the most colour-shy individuals can inject a pop of colour in their living rooms to showcase personality, fun and brightness. 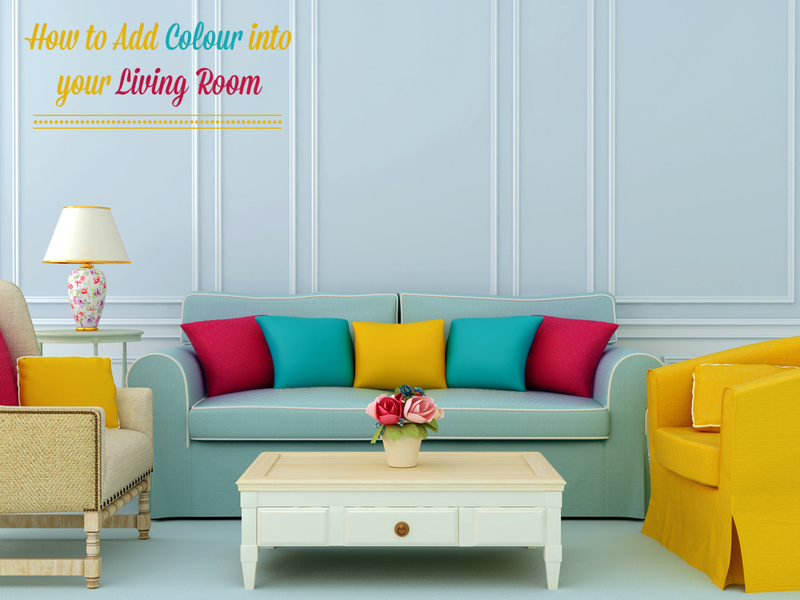 So here we go, 5 Ways to Add Colour to your Living Room. The main furniture items in your living room; sofas, arm chairs, coffee tables, side tables, etc; can be a great way to update your colour scheme without having to replace every item. For example, you could buy a new statement coloured armchair instead of buying a whole new three-piece-suite to give the furniture a new look. There is a wonderful orange armchair from IKEA which is bang on trend at the moment (it also comes in other colours if orange isn’t your thing). If you want to go for something completely different and even more out there, there’s another trend at the moment that’s emerging and that involves paring a dark living room with neon accessories, such as coffee tables or light fittings. Be bold, brave, and go neon! Soft furnishings like curtains, rugs, cushions and throws are a great way to add a pop of colour into a room without being too harsh as the soft fabrics provide a gentle appeal. Go for a large statement rug with complimenting throw cushions to keep the space coordinated but fun at the same time. Colourful curtains are another great way to brighten up a room and give it a burst of personality. 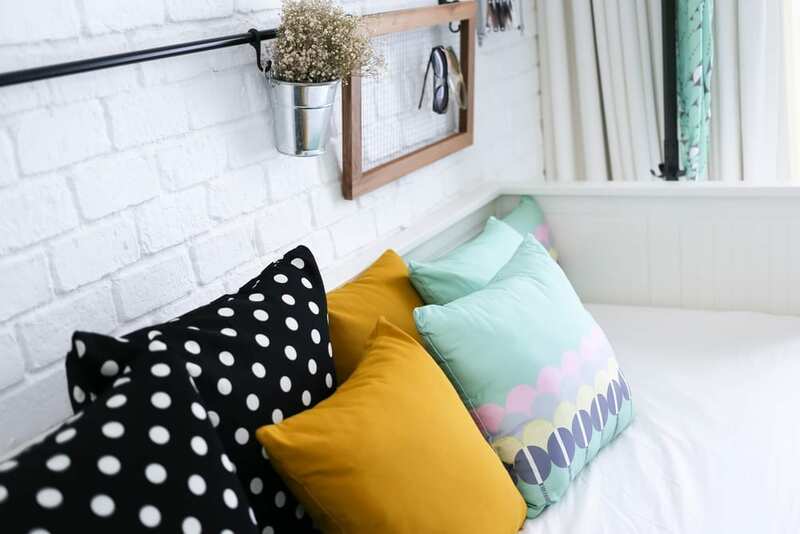 Opt for colourful fabrics that either compliment or clash well with your scheme, and keep the windowed wall otherwise fairly simple and plain to avoid a colour/pattern overload. If you’re really limited in terms of budget but still want a new colour feature in your living room, arguably the simplest and cheapest way to do this is to paint one (or two) main walls in the colour of your choice. There’s a great feature wall paint collection on the Dulux website, or you could even opt for statement wallpaper if you don’t want something plain. Go pretty and floral for a fresh, feminine feel, or go bold and brave with geometric prints. Gone are the days where the ceiling had to simply be white. Change things up and paint it a light and bright colour for a really unusual but surprisingly attractive look. Or, if that doesn’t take your fancy, be brave when it comes to picking new flooring. The floor and ceiling of the room will really act as a backdrop for the rest of the room in terms of colour and decor, so keep things fairly simple, too. The little components in your living room that you opt for are important for showcasing you and your family’s personality as well as adding to the bright colour scheme. Therefore have fun with it and get creative. Opt for quirky and bright things like colourful ornaments, mirrors and candles to keep things vibrant and interesting. Photo frames are really interesting and would look great in a fun living room. I’m a massive fan of cushions. I don’t know why but I think I’ve always been obsessed with them and I’m constantly being told that we’ve got no more room for them. If he had it his way I’m sure we’d live in a dark cave.